The permanent pool of stormwater management ponds acts as a heat sink during the summer, resulting in warmer summer discharges during both storm and baseflow conditions. The increase in water temperature, combined with the reduction in groundwater discharge to streams caused by urbanization, can lead to significant deterioration of downstream aquatic life because fish and macroinvertebrate species are very sensitive to even minor changes in temperature. 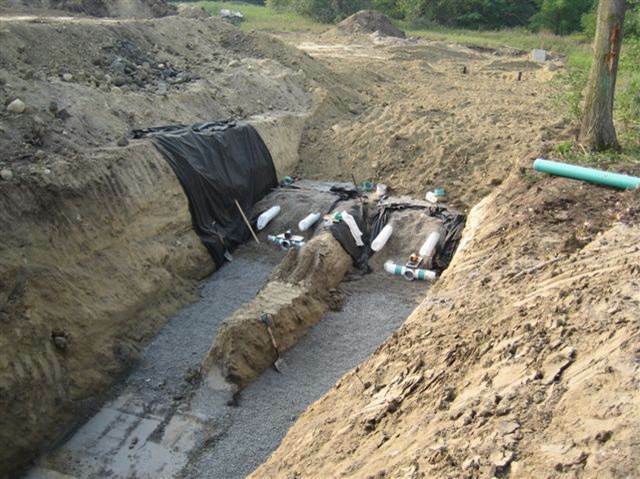 This project evaluates an innovative cooling trench feature installed as part of the stormwater management pond operation design in the West Cathedral Subdivision in Markham. The technology, known as the Groundwater Emulation Management System (GEMS), was designed to maintain cool stream discharge from the SWM pond catchment at a level similar to that experienced prior to development. This is accomplished by draining water at a controlled rate from the permanent pool of a stormwater pond to a cooling/infiltration trench. The cooling trench lowers the temperature of pond water through below ground heat transfer and discharges to the receiving watercourse at a rate and volume mimicking the natural discharge of groundwater. Estimated reductions in groundwater recharge caused by the conversion of land from agriculture and open space to residential use provided the basis for setting continuous flow rates released into the system. Photo credit: Doug McGill, McGill Development Services.